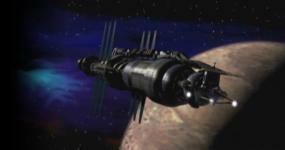 As we approach the end of Babylon 5 in our EpDis series of threads, I thought I'd just go ahead and say that we won't end here. I intend to continue on and do a thread for each of the telemovies as well as for the Crusade episodes. If only they would have had alcohol on Minbar, for visiting dignitaries, ...special occasions like Londo's visit. I've always thought the "no alcohol" thing was a little phoney. So, they don't have a bottle of Jim Beam in the back room, but certainly they would have near-100% ethyl alcohol, for use for any number of things, and without de-naturants such as we use. They could have put that in some fruit juice, or something, and easily given Londo a drink. I'd say that prudishness was a more likely real reason for not giving him a drink. If only they had known why he needed it! He should have known to bring his own bottle(s). Any ordinary alkie would have. "I know that the hypnotized never lie... Do ya?" I'm not sure the Keeper would have allowed it into the luggage. If only they had known why he needed it! He should have known to bring his own bottle(s). Any ordinary alkie would have. The Drakh, Shiv'kala, was watching him. Remember the conversation back on his ship as it was leaving? Any alcohol Londo would have been able to drink, would have to have been supplied outside of the Drakh's control, on Minbar. KoshF and KoshN, why would they let him have it on Centauri Prime, but not let him take it with him? Wouldn't they have eliminated it there, or at least kept him away from it, on CP as well, if they had fully realized the danger? They have less control over Londo on Minbar than they do in their immediate presence on Londo's ship. A drink with dinner would be part of perfectly acceptable behavior for Londo. In fact, Londo not having a drink with dinner would look positively strange for all those who know him, and John and Delenn KNOW Londo. The Drakh probably figured that there would be no alcohol available to Londo on Minbar because of the Minbari reaction to alcohol, and hence it was relatively safe to let him go there. Remember, they want him to deliver the Keeper, but don't want to raise suspicions by having Londo not acting like Londo, and we all know that Londo drinks. That still doesn't explain why they let him have alcohol on Centauri Prime, if they realized the danger. Also, he could have gotten drunk, and hidden a bottle in his luggage, before leaving. I'm sure he is clever enough to do that, if only for a contingency plan. Perhaps he did, but didn't realize that the Keeper would know what he had done once he sobered up. In that case the Keeper would have alerted the Drakh, who would have quickly and efficiently removed the alcohol. On Centauri Prime the desire to have Londo act normal would have been almost stronger, as there were those who knew him there. In the books and short stories the Drakh are truly paranoid about keeping their secret.